I saw a picture of "Prince" Harry playing polo in New York. 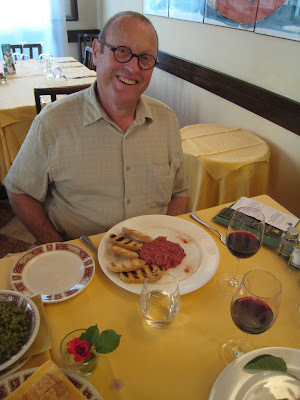 And while still working on a post about eating in Italy I thought it was time for a preview. But first I wanted to make clear my thoughts about the "royal" family. The queen--a pathetic, but pompous prisoner of the State. Phillip--of limited intelligence, and needs a muzzle and a choke chain collar to go with his short leash. Charles--means well, but looks absolutely desperate. William--"the ugly but sensible one." Harry--the village idiot, needs a DNA test to prove a relationship to the queen, but I think it just lovely how the royal family protects the virtue of Diana after her death. Say, you look wonderful and very happy! Needless to say, wish I was there. Will come back to read your posts but that is beyond my current concentration span. Tessa tells me you had a great trip with lots of delicious food. Is that why you are so happy in this pix?